When Dyamonde Daniel’s friend Damaris suddenly becomes a picky eater, it doesn’t take Dyamonde long to figure out the problem: Damaris is secretly dieting because some mean girls teased her about her weight. Dyamonde can’t let her friend go on this way. But how can she make Damaris see that she is perfect just the way she is? It turns out Damaris isn’t the only one in their class facing this problem. A girl named Amberline is also being picked on the same way. Soon Dyamonde and Damaris discover that Amberline has a secret…a serious one. Once again award-winning author Nikki Grimes tackles an important topic. 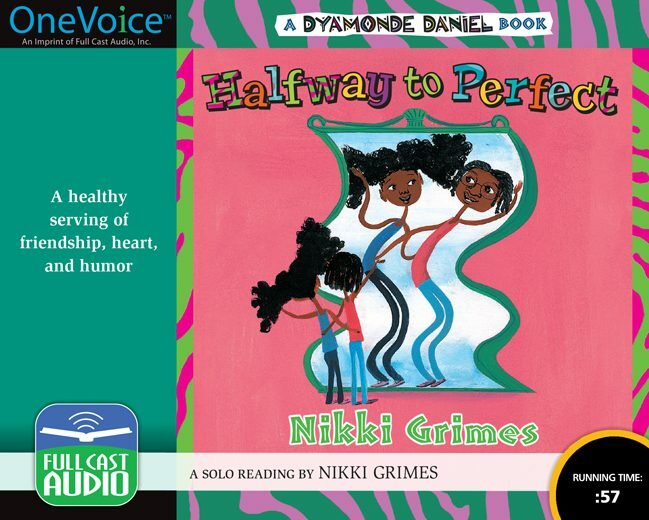 Narrating herself, Nikki’s warm and friendly voice enriches this delightful addition to her Dyamonde Daniel series with a combination of heart and humor that will engage young listeners from the very first words.